For this swap, we will create an advent calendar using tea. Therefore, each day you can have a morning or evening cup of tea while you enjoy the holiday season. If you join all 5 swaps, you will have the whole calendar. Send your partner 5 bags of tea. Decorate each tea bag with festive wrapping of some sort and the number for the day. 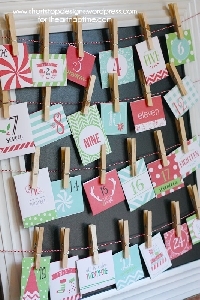 This swap is for the third set of 5 of the calendar so label the bags 11,12,13,14,and 15.